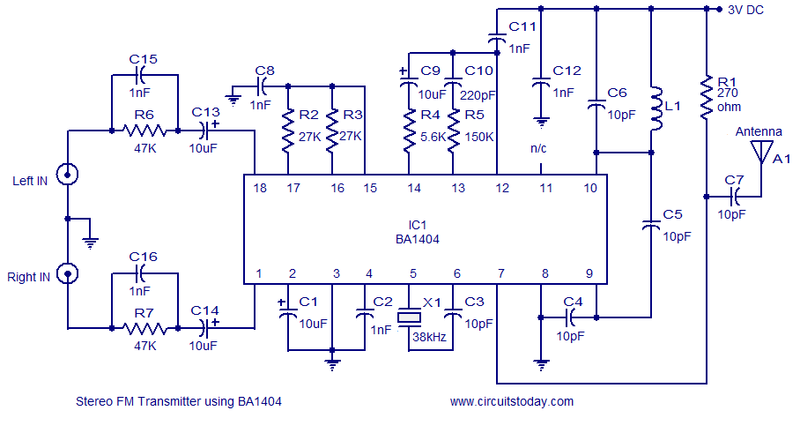 Stereo FM transmitter circuit using BA1404. A high quality stereo FM transmitter circuit is shown here. The circuit is based on the IC BA1404 from ROHM Semiconductors. BA1404 is a monolithic FM stereo modulator that has built in stereo modulator, FM modulator, RF amplifier circuitries. The FM modulator can be operated from 76 to 108MHz and power supply for the circuit can be anything between 1.25 to 3 volts. In the circuit R7, C16, C14 and R6, C15, C13 forms the pre-emphasis network for the right and left channels respectively. This is done for matching the frequency response of the FM transmitter with the FM receiver. Inductor L1 and capacitor C5 is used to set the oscillator frequency. Network C9,C10, R4,R5 improves the channel separation. 38kHz crystal X1 is connected between pins 5 and 6 of the IC. Composite stereo signal is created by the stereo modulator circuit using the 38kHz quartz controlled frequency. Powering the circuit from a battery will reduce noise. Use an 80 cm copper wire as antenna. For L1 make 3 turns of 0.5mm dia enamelled copper wire on a 5mm dia ferrite core. C13 and C14 are just coupling capacitors, nothing to do with pre-emphasis. The pre-emphasis circuit consists of C15/R6 and C16/R7 respectively, simple 1st-order high-pass filters. These ones give a time constant of about 50uS which is correct for UK, Australia, NZ, etc. For US/Canada change C15 and C16 to 1.5nF. I need a BA 1404 IC. Is it available in India ? Please give me the address. I’m ready to pay in terms of Indian currency. i too want to buy ic ba 1404. from e bay i cudnt get a seller for order 2 IC or less.. kindly give me a link. and how many days dd it take to ship the part to you? can i use it with my fm receiver?? how can I variate the output frequency? I am a professor of electronics in France, and I would like to work with my students on a stereo encoder. For that I would like two copies of 38 kHz quartz please. i want 2 have back room radio station , can you please me more about transmitters, especially how to built them to broadcast for a long distance. Can it be possible to make a radio mp3 broadcast a long distance without buying an external boaster? I LIKE THESE CIRCUIT.BUT I WANT TO LEAN MORE ABOUT THIS ESPECIAL HOW TO MAKE THEM.WHAT CAN I DO? how much is the inductance range /value of L1? can i replace it with different type but with the same value? Hi Nin you can use series LC tuned circuit between Pins 5 and 6. Hi Nin you can try LC network than RC, but tuning is critical without proper test instruments. But the 38KHz crstal will be best. i encountering a hard time looking for 38khz oscillator..can i utilized RC osc. instead? as an alternative or replacement for the said crystal oscillator? With the above transmitter and 1/2 wavelength antenna you can get the signal within the house. say within 50 feet or so. if you want higher range you have to feed the output of this IC to a 5watt or better RF amplifier. Left in and right in are audio inputs, of course. How’s the power and signal range with this transmitter? Could it be made for >1 km? am a researcher, a student studing electrical engineering networking and telecoms is my field. From where can I get BA1404 it is not available in our area(kerala, TN). can any one suggest a shop (with address) in south india ! “where can i get 38kHz crystal oscillator please tell me. Any information about L1 ?? I have a problem with this coil. I canâ€™t make it properly at home.